Opening weekend $66.114 million on 3359 screens. At this point, it seems that most people forget what a risky production Titanic was. A worldwide gross of almost two billion dollars tends to erase those issues, I guess, but that film indeed seemed more likely to end up as a bust than a smash, and with a huge budget of $200 million, it certainly could have been a major disaster. As I write this, two more films in the series remain to come, but right now, it looks like the Lord of the Rings trilogy will end up as a massive success. I suppose it’s possible the second and third flicks in the series will tank, but given the rapturous reception accorded the initial entry, 2001’s The Fellowship of the Ring, I seriously doubt that’ll occur. If those movies - 2002’s The Two Towers and 2003’s Return of the King - indeed find an audience as large as that obtained by Fellowship, then I also suppose folks will lose sight of how chancy an enterprise the series was. In fact, the Rings trilogy may well be the ballsiest production in recent history. New Line committed about $300 million to the creation of the three films before director Peter Jackson filmed one frame. He shot all three flicks in one massive 15-month period, so if Fellowship tanked, the deal was already done. Given the fairly modest resources at New Line, a flop could potentially have killed the studio. Happily, that won’t be the case. Even if the two subsequent chapters in the Rings saga fail to sell as many tickets, I can’t imagine they won’t still become solid hits, and New Line should come out of this with a big grin. While the financial success of the series seems a given, it will be interesting to discover how well the critics receive the subsequent films. It’ll be hard to top the greeting accorded Fellowship, as it earned almost unanimous critical praise and also nabbed a whopping 13 Oscar nominations. Fellowship even snared a nod in the Best Picture category, something exceedingly rare for a film of this genre. Personally, I think Fellowship offers a very good movie, though I’m not quite sure it merits such heavy praise. Actually, I’ll admit my opinion of it has increased since I saw it theatrically. At that time, I thought it seemed good but it didn’t exactly dazzle me. Perhaps all of the advance plaudits made it tough for the movie to live up to expectations. On second viewing, however, I felt better able to take the movie on its own merits. Fellowship stands as the first chapter in the series, which means it probably will be the one with the most expository information. The plot itself seems fairly simple, but the myriad of characters complicates matters. Here goes: back in Ye Olden Dayes, some critters created a series of powerful rings. At the top of the food chain resides the One Ring, made by the dark lord Sauron as his trump card. It became lost years ago, but eventually hobbit Bilbo Baggins (Ian Holm) finds it. The ring allows him to live an exceptionally long life, but it also starts to corrupt him. He decides to flee Hobbiton and he leaves the ring to his nephew Frodo (Elijah Wood), who gets some guidance from wizard Gandalf the Grey (Ian McKellen) and learns that he needs to journey to Mordor to destroy the ring. Why not just bust it right there? Apparently it can only be crushed in the spot where it was cast. Mordor isn’t just a simple cab ride away from Hobbiton, however, so Frodo starts on a perilous trip. Gandalf entrusts another hobbit named Samwise Gangee (Sean Astin) with Frodo’s care, and a couple of other hobbits - Pippin Took (Billy Boyd) and Merry Brandybuck (Dominic Monaghan) - also come with them. Along the way, they gather a party that becomes known as the Fellowship of the Ring. This group includes elfin archer Legolas Greenleaf (Orlando Bloom), axe-wielding dwarf Gimli (John Rhys-Davies), and humans Boromir (Sean Bean) and Strider (Viggo Mortensen). We eventually learn that the latter is really named Aragorn, the heir of Gondor, the human who once possessed the ring years earlier. To complicate matters, many folks try to stop Frodo et al. as they journey to Mordor. The Ringwraiths work at the order of Sauron, and evil wizard Saruman the White (Christopher Lee) also controls many forces, most of which come at former friend Gandalf. Much of the film follows the Fellowship’s battles as they trek toward Mordor. About a billion other characters show up along the way, and the story offers many other complications, but this basic synopsis gives you an idea of how the film works. As I alluded, the essential storyline really is quite simple: Frodo needs to get to Mordor to destroy the ring. The journey itself - along with all the characters - are what make up the intricacies of the tale, and they do so quite well. Perhaps the overwhelming amount of information provided in Fellowship is part of the reason it didn’t do that much for me during my initial viewing. I possessed an exceedingly rudimentary knowledge of Tolkien’s universe before I saw the film. I knew a few names and concepts but little else. I never read the books or saw any earlier movie adaptations, so most of the project was new to me. Upon my second assessment, I felt better able to enjoy Fellowship for what it offered. I can’t call it a flawless movie, though it does very well for itself. Most of the film’s weaknesses occur during its first hour. While much of the flick includes a great deal of exposition, the initial act really tosses out a lot of detail, virtually all of which becomes important down the road. Director Peter Jackson shows this information in a stylish and clear way, but the sheer amount of material makes it a little tough to take. I also could live without the moments in Hobbiton. Of course, these scenes are essential to set up Frodo, Bilbo, and some of the others, and the movie wouldn’t function as well without them. However, most of the film’s cutesy moments appear during this area, and I think the Hobbiton parts - necessary as they are - move somewhat slowly. Nonetheless, Jackson moves them along at a reasonable pace, and I doubt anyone else could have handled them any better. For such a long film, Fellowship does show solid pacing. Other than the semi-slow Hobbiton bits, the movie rarely sags. Jackson appropriately mixes the action with more character and plot based moments, but he never does so in a formulaic manner. In some flicks, you get a sense that quieter moments exist for no reason other than to give the audience a quick break. That doesn’t happen in Fellowship; the breaks seem logical and never come across as gratuitous. My other main complaint about Fellowship greets most effects-intensive films made these days. At times, the computer graphics seem fairly dodgy. Most of the material in Fellowship works fairly well, but some of it comes across as distractingly fake. For example, the big bald beastie in Balin’s Tomb never seems even remotely convincing. Admittedly, though, I’m more sensitive to CGI than most, so I expect the majority will not feel as negatively as I. Despite some somewhat weak CGI, most of the visuals in Fellowship seem absolutely gorgeous. Jackson brings the world of Tolkien to life with excellent clarity and vividness. He creates a stylized location that never seems excessively arty or forced. While I maintain a limited knowledge of the source material, I think Jackson keeps things true to that vision but he avoids potentially cheesy aspects. Fellowship offered Jackson’s first film since 1996’s The Frighteners, and based on his résumé, it was hard to see him as the right man for the job; he’s never tackled anything even remotely approaching the scope and scale of this series. However, based on the initial flick, he seems more than up to the task. While Fellowship includes many strong elements, Jackson ties the whole thing together with a terrific sense of style and an authority that makes the project coalesce neatly. The many action scenes seem especially excellent. The material flows naturally and Jackson creates a vivid and vibrant series of fight sequences that mesh together wonderfully. He doesn’t do anything unique, but these scenes nonetheless appear fresh. Really, it’s very hard to find much fault with Fellowship. Again, I can’t say the film bowled me over to the degree experienced by so many others, but I can’t really disagree with these assessments. In Fellowship, Peter Jackson creates a land of faeries and elves for people who can’t stand lands of faeries and elves while he also makes sure that fans of the genre will love it as well. 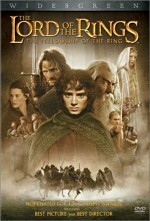 The Lord of the Rings: The Fellowship of the Ring appears in an aspect ratio of approximately 2.35:1 on this single-sided, dual-layered DVD; the image has been enhanced for 16X9 televisions. Overall, the picture seemed solid, with very few flaws on display. Sharpness appeared excellent. The movie always remained nicely crisp and distinct, and I noticed virtually no instances of softness or fuzziness. Jagged edges and moiré effects created no concerns, and I also detected no signs of edge enhancement. As for print flaws, the movie showed a wee smidgen of grain at times, but this remained very minor. Otherwise, the image seemed free of any form of defects. Fellowship enjoyed a stylized palette that varied dependent on the location. For example, when we entered elf territory, the film adopted a more golden tone. The colors always remained nicely vivid and vibrant, and they showed no problems related to bleeding, noise, or other concerns, even when we entered some red-dominated areas. Black levels came across as deep and dense, while shadow detail was appropriately heavy but not overly thick. Ultimately, the image of Fellowship looked pretty terrific. I also felt pleased with the Dolby Digital 5.1 EX soundtrack of Fellowship, though I admit it didn’t overwhelm me to the degree apparently experienced by others. I’ve read massive praise for the mix that I don’t think it merits. Actually, the audio did overwhelm me, which was the problem. Bass levels went off the chart during much of the film, and I don’t feel that more is necessarily better. Fellowship poured on the low-end to an excessive degree, and it became a distraction at times. It seemed like every little noise pounded my subwoofer into submission, and this felt over the top and unnecessary. Some may love this emphasis on heavy bass, but it dissatisfied me to a small degree. Three months after this initial DVD release of The Fellowship of the Ring, New Line will produce a super-special edition that packs hours and hours of extras. Because of that, this two-disc set seems destined to become regarded as the “bare bones” version. However, that interpretation would seem very incorrect. While this package doesn’t include nearly as much material as the subsequent one, it still offers a lot of goodies. All of these appear on DVD Two; this version of Fellowship doesn't provide an audio commentary or anything else on the first platter. We start with a series of promotional documentaries. An in-store special created by book publishers Houghton Mifflin, Welcome to Middle-earth In-Store Special runs 16 minutes and 44 seconds. It mixes many film clips with some behind the scenes shots and a series of interviews. In the latter category, we hear from publisher Rayner Unwin, director Peter Jackson, author of "The Lord of the Rings Official Movie Guide" Brian Sibley, conceptual artist Alan Lee, Houghton Mifflin Director of Tolkien Projects Clay Harper, WETA Workshop President Richard Taylor, and actors Cate Blanchett, Ian McKellen, Orlando Bloom, Elijah Wood, and Viggo Mortensen. 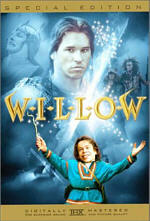 Probably the best of the DVD's documentaries, "Welcome" is also the shortest and the most promotional; it touts Fellowship as "the most anticipated film of all time", which is a crock. However, it includes some good shots from the set, and the chat with Unwin provides some wonderful information. He was involved with the original publication of the Rings series and he adds great notes about its early days. Heck, he even possesses a name that sounds like a Rings character! Next we find Quest for the Ring, a special that ran on Fox TV. It lasts 21 minutes and 26 seconds and includes the same combination of movie scenes, behind the scenes material, and interviews. In this one, we hear from director Jackson, WETA President Taylor, producer Barrie Osborne, and actors Blanchett, Wood, Liv Tyler, McKellen, Mortensen, Sean Astin, Billy Boyd, Dominic Monaghan, Bloom, John Rhys-Davies, Christopher Lee, and Sean Bean. Another heavily promotional piece, “Quest” fails to include as much substance as “Welcome”. Again, we find some good shots from the set, but the overall tone seems superficial. Much of the piece simply explains the story and the characters, and it includes little insight into the production. Too many movie scenes show up as well. It still provides some decent shots, but most of these appear elsewhere, so “Quest” feels fairly superfluous. Moderately better is A Passage to Middle-earth, which ran on the Sci-Fi Channel. At 41 minutes and 36 seconds, “Passage” provides the longest of the disc’s programs, and it also uses the same format as the others. For the interview segments, we get comments from director Jackson, WETA President Taylor, producer Osborne, production designer Grant Major, ring creator Thorkild Hansen, co-writer Philippa Boyens, propmaster Nick Weir, swordmaster Bob Anderson, conceptual designer Alan Lee, casting Liz Mullane, costume designer Ngila Dickson, dialect coaches Andrew Jack and Roisin Carty, supervising art director Dan Hennah, special effects creator Greg Butler, assistant swordmaster Kirk Maxwell, chainmailer Chris Smith, director of photography Andrew Lesnie, conceptual designer John Howe, and actors Blanchett, Wood, Lee, Bloom, McKellen, Astin, Boyd, Mortensen, Tyler, Hugo Weaving, Rhys-Davies, and Monaghan. That’s the most extensive roster of the set, and “Passage” offers the most detailed experience. I prefer “Welcome” due to its unique materials, but “Passage” provides a decent piece. Actually, it feels a lot like a longer version of “Quest”, as it also includes many scenes from the movie and a fairly generic promotional tone. However, it tosses in more of a focus on the behind the scenes material, and we learn some good notes about the film. There’s less emphasis on cast and story and more of a concentration on production design, the different races, and other elements. Overall, “Passage” seems like a fairly good little show. 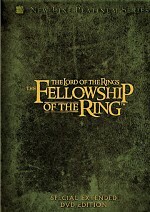 Next we encounter 15 different featurettes that originally appeared on Lordoftherings.net. These segments run between 96 seconds and four minutes, 34 seconds for a total of 38 minutes and 54 seconds of material. The programs concentrate mainly on behind the scenes shots, with some interview clips also tossed in for good measure. We hear from director Jackson, conceptual designers Lee and Howe, local farmer Ian Anderson, costume designer Dickson, supervising art director Hennah, production designer Major, producer Osborne, director of photography Lesnie, special physical effects technician Darryl Richards, dialect coach Carty, Harper Collins Ltd.’s Jane Johnson, composer Howard Shore, WETA President Taylor, and actors McKellen, Astin, Wood, Tyler, Mortensen, Boyd, Bloom, Monaghan, Lee, and Blanchett. Six of the featurettes focus on specific actors; we get segments on Wood, Mortensen, Bloom, Blanchett, Tyler and McKellen. The other nine look at different elements of the production; from locations to effects to music, we learn about a nice mix of subjects. The package lacks great depth but if provides a nice “you are there” tone that makes the clips interesting. They don’t substitute for a rich documentary, but they seem enjoyable. The rest of the extras follow a very promotional line. We get three trailers, all of which appear anamorphic with Dolby Digital 5.1 sound. In addition, six TV Spots appear, as does a music video for “May It Be” by Enya. This is a very standard song-from-a-movie video. 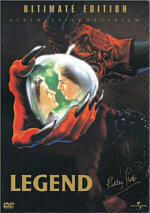 It mixes lip-synch shots of Enya with many shots from the film. Both the song and the video seem exceedingly dull. Fellowship fans may hate the Special Extended DVD Edition Preview, since it may make their wait for that package seem even longer. Actually, I doubt the 184-second piece will frustrate too many. It quickly discusses the additions to the film and the package’s supplements, so it’s a nice appetizer but nothing terribly compelling. Even more enticing for fans is the Behind the Scenes Preview of The Two Towers. Scheduled to come out in mid-December 2002, this 10-minute and 42-second program mixes scenes from that film with some interviews. We get notes from director Jackson, producer Osborne, executive producer Mark Ordesky, WETA President Taylor, and actors Wood, Boyd, Monaghan, Miranda Otto, Andy Serkis, Bloom, Mortensen, and Astin. We hear about the movie’s basic plot and learn of some distinctions, including new actors. We also see a little of the creation of some visual effects like Gollum. Yet another promotional preview touts the Two Towers Video Game. In this 181-second clip, we hear from game producers/co-directors Scott Evans and Hudson Piehl as they tell us about it and relate what they wanted to do with it. We also see some images from the product. Lastly, Fellowship features some DVD-ROM materials. We find two different weblinks. One goes to the official movie website at Lordoftherings.net, while the other provides “exclusive online content”. The latter doesn’t give us much right now. As of a week after street date, it offers computer wallpaper, a screensaver, and e-cards. The site promises additional pieces in the future, however. Fans had high expectations for The Lord of the Rings: The Fellowship of the Ring, and the film seems to match them. As a neophyte to the realm, I feel the movie has some minor flaws, but overall it comes across quite well, and it offers an exciting and rich experience. The DVD offers very good picture and sound - despite some excessive bass - and tosses in a moderately superficial but still solid roster of extras. Fellowship comes with my recommendation. Note: as I mentioned earlier, New Line will produce a much more elaborate DVD package of Fellowship three months after the release of this two-disc set. That version will include a substantially longer cut of the film as well as tons of extras not found here. From what I understand, virtually none of this package’s supplements will also appear on the “deluxe” set. In addition, this one will offer the only way to see the original theatrical version of the film.